Evaporated Milk is a sterilized product. The product finds a large market in tropical countries. It is used where fresh milk is not available. It is also used in cooking and as a Coffee/Tea Whitener. 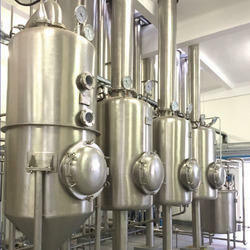 4, 000 L/H continuous aseptic processing module for indirect UHT treatment in Tubular Heat Exchanger (THE) of white milk. The module is fully automated to safeguard the aseptic status while in production. The operation can be divided into four steps; Pre-Sterilisation, Production, Aseptic Intermediate Cleaning (AIC) and Cleaning-in-place (CIP). Evaporated milk is a sterilized product, light & cream color. The product finds a large market in tropical countries. It is used where fresh milk is not available. It is also used as a substitute for breast milk, in which case Vitamin D is added. Is is also used in cooking as a Coffee/Tea Whitener. 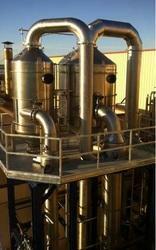 York steel can supply evaporated milk plant of various capacities. Description: made from skimmed cow's milk with added ingredients, tina® evaporated filled milk is perfect for creating creamy meals and treats. It can be used in tea, coffee, desserts and as a substitute for cream.